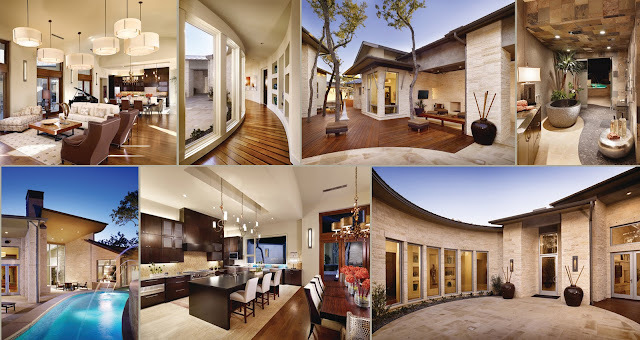 Winner of five awards in the 2008 Parade of Homes, this Santa Barbara style home features a welcoming colonnade, lush courtyard, beautiful casita, spacious master suite with a private outdoor covered terrace, and a unique Koi pond beginning underneath the wine room glass floor and continuing to the outdoor living area. In addition, the views of Lake Travis are unmatched throughout the home. 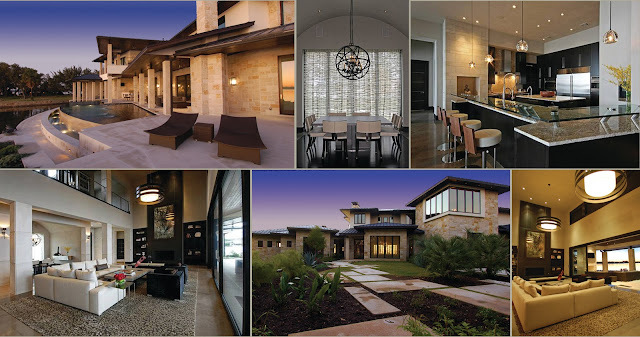 Designed for the Spanish Oaks Tour of Homes, this Texas Hill Country Contemporary home provides multiple indoor and outdoor living experiences. The home begins across a breezy Lanai, which opens to the courtyard and highlights a sitting area as well as a detached casita. The Foyer opens across to another outdoor living area featuring a one-of-a-kind “fire trough” that blends into the spa and serves as a contemporary fire pit for the backyard. The Great Room features a stunning stone fireplace wall with slivers of inset wood to create a beautiful sculpture across the wall. Flanked on both sides by large doors and transoms, the home has the ability to open the courtyard through to the back of the house via the prime living areas. An especially stunning feature is the design of the sanctuary Master Bath. A glass pivot wall opens the slate and stone room, which features a hand-cut stone soaking tub, to a luxurious outdoor shower experience. Care was taken in every aspect of the home’s design, creating each space to be distinctive, providing a unique feature or experience. 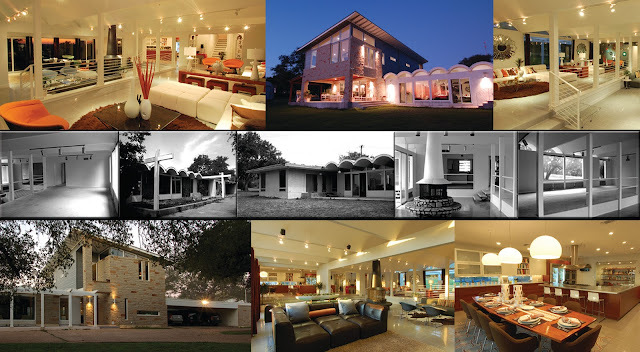 One of the key goals in developing the design for the renovation of this existing 50 year old residence was to provide a livable house which would frame and accentuate the owner’s extensive collection of Mid-modern furnishings and art while stretching and blending its existing character into a modern and clean 21st century version of the style. Poised on the edge of a deep ravine overlooking the beautiful Barton Creek, the core of the home centers on the kitchen. This particular space was artfully collaborated on with the home's owner, who is the owner and chef of one of Austin's premiere restaurants. Extensive living areas were recouped and added to from the home's original design. The master suite was taken to the second floor and wrapped in glass to take advantage of the coveted Texas Hill Country vistas. Approximately seventy percent of the original home was kept, replacing only the small existing kitchen and master bedroom. Material selections were chosen based on sustainable criteria to make this remodel a "green" gem as well as a museum of modern furniture. As a vacation home with an amazing locale, this home was designed with one primary focus: utilizing the breathtaking lake views. The original property was a small island pie-shaped lot with spectacular views of Lake LBJ. Each room was created to depict a different snapshot of the lake due to the site’s unique footprint. Double 8’x11’ tall sliding glass doors merge the indoor living to the outdoor living, thus creating a seamless flow from inside to outside. The swimming pool, with its vanishing edge, was designed in such a way that it integrates the lake to the outside living terrace, giving the feeling of actually being on the lake. There is also a twelve foot beach area under the archways of the pool’s water features for relaxing and entertaining. The beauty of the home is enough to stand alone, but being on the lake makes the entire design come together as a truly stunning vacation home.